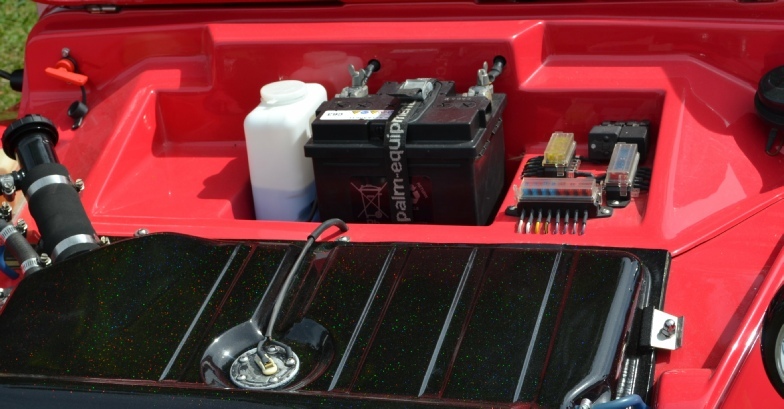 Most traditional buggy kits have the battery located behind the drivers seat, in the same location as the original beetle donor. However, the integrated dashboard panel on the Doon allows for the battery to be moved much further forward and to sit beneath the bonnet. This provides two important benefits. 1. Essential weight is moved to the front from the rear of the buggy. This improves weight distribution and helps reduce the risk locking up of front brakes typically associated with lighter front ends. 2. Battery security is vastly improved as being locked under the bonnet stops unwanted tampering.